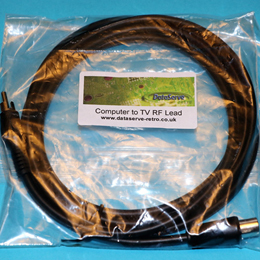 Brand New RF Computer to Television Lead for the Atari 400, 600 and 800XL Computers. These leads are not that easy to get hold of now and the "made up" versions tend to give a low quality or unreliable signal. They are not the original Atari leads with the suppression box, but they work perfectly well. This lead is new, factory sealed lead and will give a clear and steady picture.